Khan Academy’s best use for the average teacher? Differentiated instruction. For those who don’t know, Khan Academy is an outstanding web site funded mainly by the Bill and Melinda Gates foundation that provides online lectures and exercises in multiple disciplines. It is completely free, and provides amazing tools for differentiating instruction and gleaning student data. In the interest of full disclosure, some educators love Khan Academy, some hate it, yet few seem to understand it — which is why I’m writing this. You can count me firmly in the “love” category; I think it’s one of the greatest things to hit Education in years. So when I found out I was teaching some math classes in a computer lab last year, I was very excited to give it a shot. I asked my principal (Dean Ledford) and assistant principal (Aaron Lakatos) for permission to use Khan Academy as the daily driver for my Algebra II classes, and they agreed to let me use it in class (very supportive administration at Sandalwood in my experience!). I pushed the envelope a little bit and ended up almost exclusively using Khan Academy to teach Algebra II (both Standard and Honors) last year, with, I think, very good results. I will say that the pure “flipped classroom” model Khan Academy espouses (where watching video lectures is “homework” and the math problems are completed in class with teacher assistance) did not work for me, mostly because (a.) most students (even Honors students) don’t do a lick of homework, and (b.) a shocking number of kids have no computer at home. However, a hybrid version of the flipped classroom that I settled on worked wonderfully. Basically, I mapped all Algebra II Sunshine State Standards to Khan Academy video lectures, then mapped about 75% of the standards to Khan Academy assignments. The textbook was used to fill in the gaps (there were surprisingly few). I asked students to watch the lectures at home, knowing full well almost no one would do so. I then “reviewed” the video lecture with a quick 15-25 minute lesson with example problems from either the textbook or Khan Academy. The last 60-75 minutes of class, I let the kids do their “homework”, usually on Khan Academy. This, to me, was the main thing the “flipped classroom” experiment taught me as a teacher: shut up, stop lecturing so much, and give the kids time to do their work in class so that (a.) I’m there to make sure they actually do it, and (b.) I’m around when they get stumped. True differentiated instruction: I gave enrichment lessons to advanced students and remedial lessons (like fraction arithmetic, the bane of most math students’ existence) to struggling students as needed without using class time. I taught all lessons live, but my pacing guide listed Khan Academy videos that reinforced the day’s standard. This was wonderful for students who needed a lesson explained a different way, or for students who missed a lesson. When stumped on homework, students could ask for “hints” on problems with neither penalty nor credit (very powerful, see below). Students worked unlimited problems until proving “proficiency” in a topic to earn credit. “Proficiency” is earned by answering a consecutive number of problems correctly the first try. I had real-time lists of “struggling” and “proficient” students. When “struggling” with classwork, I walked to their desks and said, “I see you’re having trouble.” They usually were relieved, especially the proud or shy. Homework grades skyrocketed despite higher standards for receiving credit (Proficiency = 100%, anything else = 0%), and dipped down to normal levels on paper assignments. Blue bars are correct answers, red bars are incorrect answers. Question marks indicate where the student asked for hints. A hint marks the problem “incorrect”, but students are encouraged to use hints as a learning tool, as this student did here. The height of the bar indicates the amount of time spent on the problem. On problem #11, she spent five minutes, then got her first correct answer. She struggled through problems 12-14, then answered 17 of the next 18 correctly on the first try, proving proficiency. 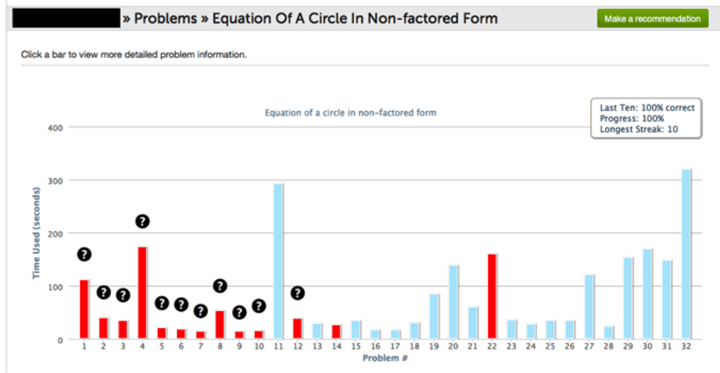 A paper assignment of 10-12 problems may have resulted in wrong answers and no mastery. The use of Khan Academy both allowed and required her to press towards mastery. Khan Academy gives you exactly as many problems as you need. If you get the first five right, and quickly, Khan Academy generally marks students proficient. Students who struggle keep getting more problems until they show proficiency. As you’d expect, students initially complained about sometimes having to do 30-40 problems to get credit. But the strangest thing started happening: eventually, they started complaining when I gave textbook assignments because (a.) the textbook couldn’t help them as well when they were stumped, and (b.) the textbook didn’t demand proficiency! Students actually complained about this! This use of Khan Academy (combined with my work in the IT Academy) was featured in an article in the Florida Times-Union complete with one of the worst pictures of me ever taken (“Teachable Moments: Technology Meets Tradition”). You seriously can feel free to contact me if you want pointers on getting started on Khan Academy.